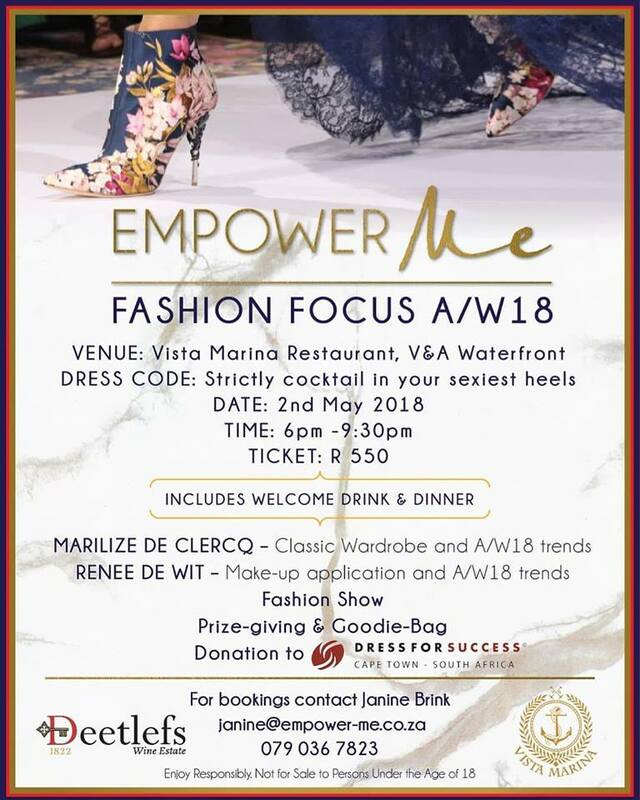 Empower Me is thrilled to announce their next event themed “Fashion Focus A/W18” will be taking place on Wednesday, 2 May at Vista Marina, which is sure to get guests wardrobe-ready and inspired for winter. Guest speakers for the evening will be personal stylist, Marilize De Clercq and make-up artist Renee De Wit, from Gorgeous2Go. Marilize will be presenting a classic autumnal wardrobe as well as upcoming Autumn/Winter 2018 fashion trends to look out for. Renee will be sharing make-up tips and upcoming trends. Tickets are priced at R550 and include a glass of Deetlefs wine or bubbly on arrival, inspiring talks by fantastic guest speakers, a delicious dinner, goodie-bag, fashion show and prize-giving. The evening will close off with a light-hearted after party. Deetlefs Wine and Mercedes-Benz Century City are among the esteemed sponsors for the evening. Dress code is strictly cocktail chic. Guests are encouraged to bring along a notebook and a pen to take notes. A percentage of this event’s ticket sales will be donated to the Dress For Success foundation. A clothing drive of gently worn work-wear will be collected on arrival. Empower Me is an exclusive women’s network, the first of its kind, offering a diverse platform to elevate women in all aspects of their lives. Inspiring, motivating and empowering women to become the best authentic version of themselves. The network includes a monthly glamorous event (as mentioned above) as well as an exclusive and limited membership “club”. This membership is limited to 200 members and offers insiders access to special offers, prize giveaways from their generous sponsors as well as access to business networking functions and exclusive social events. For more information on becoming a member or to book your ticket, please contact Janine Brink on 079 036 7823 or janine@empower-me.co.za.